Today - February 12th - marks the 202th anniversary of the birth of Charles Darwin. 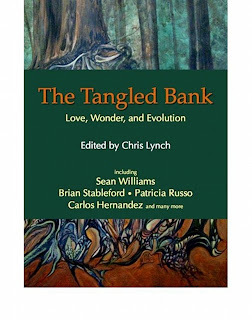 Just in time to celebrate, the print version of The Tangled Bank: Love, Wonder, and Evolution - an anthology of evolution-related fiction from Tangled Bank Press - has just been released in print. [. . . ] The Tangled Bank: Love, Wonder, and Evolution is bursting with stories, poetry, and full-page artwork about the meaning of evolution. From science ﬁction and fantasy, to comedy and horror, to fairy tales and literary ﬁction, this anthology has something for everyone. An international lineup of more than 40 contributors includes Sean Williams, Brian Stableford, Patricia Russo, Carlos Hernandez, Jetse de Vries, Christopher Green, Bruce Boston, and Emily Ballou. Dark, whimsical, and shot through with wonder, The Tangled Bank explores the universe Charles Darwin revealed. Chris Lynch has generously sent me a copy of the e-book, and I'm looking forward to reading it. The bits I've sampled so far have been both interesting and entertaining. It's also beautifully illustrated with drawings by Ernst Haeckel. If you'd like a sample, you can read Christopher Green's short story Darwin's Daughter for free.